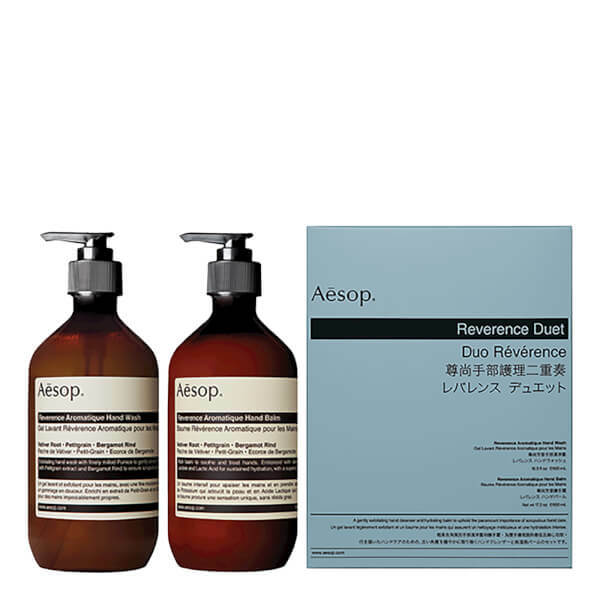 The Aesop Reverence Exfoliating Duet combines a duo of complementary hand treatments to scrupulously clean and efficiently hydrate. 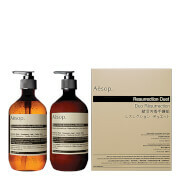 Both featuring an intense, woody aroma, the hand wash and balm leave skin feeling moisturised and smooth. Eliminate dirt and impurities with this intensive handwash. 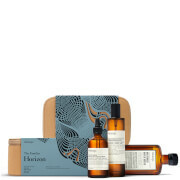 Ideal for hands that do manual labour, it works to combat dryness and care for the skin, enriched with finely milled Pumice for gentle exfoliation and Bergamot Rind to purify. Non-greasy and lightweight, the hand balm intensively moisturises dry and chapped hands, helping soothe and repair callouses and sores. It quickly melts into skin and seeks to transform even the most abused and rough skin, treating cuticles and nails as well for refined and softened hands. 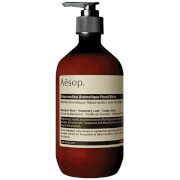 Dispense a single pump of hand wash into damp hands, lather then rinse thoroughly. Follow with hand balm as often as desired, paying close attention to cuticles. Also suitable for all-over body use. 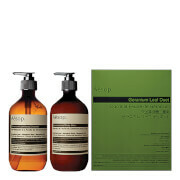 Hand Wash: Water (Aqua), Sodium Laureth Sulfate, Acrylates Copolymer, Pumice, Coco-Betaine, Cocamide DEA, Polysorbate 20, Citrus Aurantium Bergamia (Bergamot) Fruit Oil, Citrus Aurantium Amara (Bitter Orange) Oil, Vetiveria Zizanoides, Root Oil, Citrus Grandis (Grapefruit) Peel Oil, Fusanus Spicatus Wood Oil, Sodium Hydroxide, Methylchloroisothiazolinone, Methylisothiazolinone, d-Limonene*, Linalool*, Farnesol*. Hand Balm: Water (Aqua), Glycerin, Prunus Amygdalus Dulcis (Sweet Almond) Oil, Stearic Acid, Cetearyl Alcohol, Ceteareth-20, Cocos Nucifera (Coconut) Oil, Macadamia Ternifolia Seed Oil, Citrus Aurantium Bergamia (Bergamot) Fruit Oil, Glyceryl Stearate, PEG-100 Stearate, Phenoxyethanol, Tocopherol, Butyrospermum Parkii (Shea Butter), Theobroma Cacao (Cocoa) Seed Butter, Potassium Lactate, Citrus Aurantium Amara (Bitter Orange) Oil, Vetiveria, Zizanoides Root Oil, Triticum Vulgare (Wheat) Germ Oil, Glycine Soja (Soybean) Oil, Lactic Acid, Citrus Grandis (Grapefruit) Peel Oil, Fusanus Spicatus Wood Oil, Disodium EDTA, Benzoic Acid, Dehydroacetic Acid, Ethylhexylglycerin, Aloe Barbadensis Leaf Juice*, Daucus Carota Sativa (Carrot) Root Extract, Beta-Carotene, d-Limonene *, Linalool *, Farnesol *, Citral *.